· What is a service catalog? · Why is it important to our organization? · When should a service catalog be used? · How should we be using it? · How can we avoid getting sucked into the hype and target real customer value? In order to respond effectively to these questions, we need to go beyond the traditional thinking and the “speeds and feeds” elements that IT considers when evaluating vendors/technologies. Organizations must consider both qualitative and quantitative factors that directly affect both the customer and service provider organization, helping to build a bridge between the infrastructure used to help build/provide a service catalog and the key activities that customers perform in pursuit of organizational goals. We need to identify the set of questions and factors which address the need for the service catalog and how IT needs to work to see that their efforts will directly translate into customer-visible results. 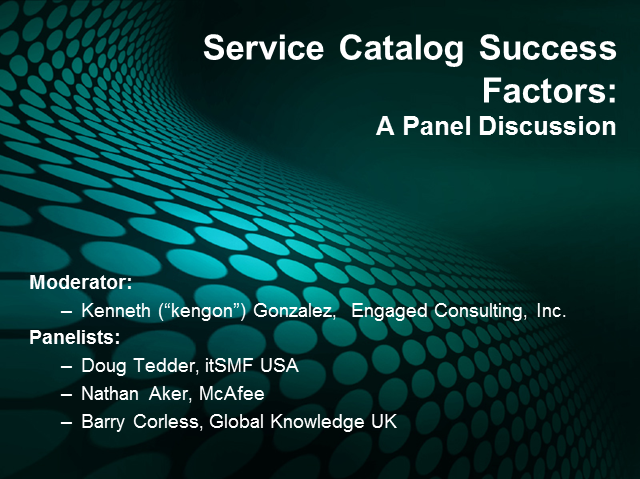 During this webinar, our expert panel will have a focused discussion about the key themes your organization should be paying attention and those things you should be doing to in order to help ensure the success of any service catalog initiative. Please join us for this important discussion.